Tech savvy identity thieves are on the prowl everywhere. In fact, A LexisNexis 2016 Fraud Mitigation Study reported that in 2015 fraudsters stole $15 billion from 13.1 million identity theft victims. And now, with embedded RFID chips, your identity is being further exposed to compromise. Credit cards, debit cards, drivers' licenses and passports can be illegally scanned while still in your wallet or purse. Don't let electronic pickpockets compromise your identity. 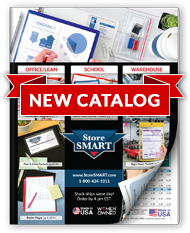 StoreSMART offers a simple and inexpensive defense: Anti-Theft RFID Blocking Sleeves. Made of copper paper with aluminum coating, these sleeves block the signals that expose your important information to illegal scanning. We've provided a simple way to help guard against it. StoreSMART's Anti-Theft Blocking Sleeves are made of reinforced materials, much more durable than the basic paper RFID blockers you may see elsewhere. Size: 3 7⁄8" x 5 ½" for U.S. passports.